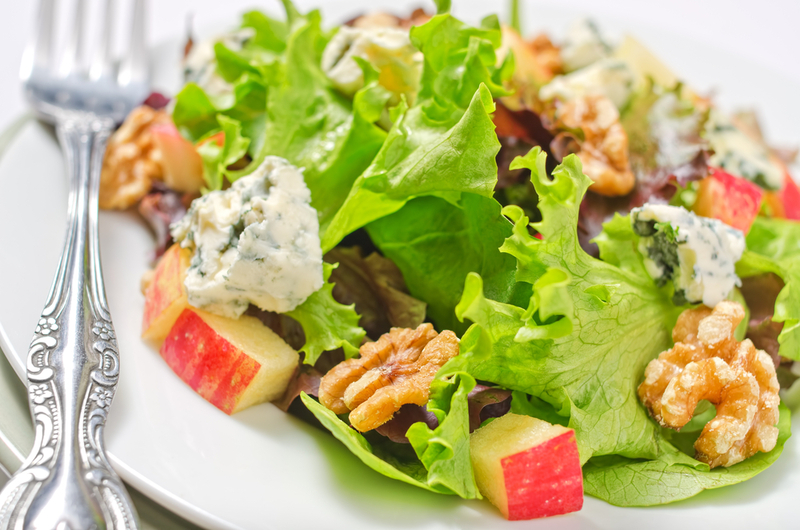 It’s a timeless American classic that has been around for over 100 years, and if you have never had the Waldorf salad, you will love this delicious recipe that’s a perfect addition to your meal, or all by itself! First created in 1896 at the luxurious Waldorf-Astoria Hotel in New York City, it became an instant success as one of its signature dishes and is the most frequently ordered recipe at the hotel from visitors around the world. Normally made of fresh apples, celery, grapes, and walnuts with mayonnaise on a bed of lettuce, this recipe adds blue cheese, sour cream, buttermilk, raisins and cranberries with some lemon juice for a little zip. A classic recipe with more creamy flavor and a nice crunch. It’s scrumptious! It’s light, refreshing, creamy, easy to make, and delicious! Try it. You’ll be so glad that you did. In a small bowl, combine the sour cream, mayonnaise, buttermilk, ½ cup of the blue cheese and brown sugar. In a large bowl, combine the apples, grapes, celery, raisins, dried cranberries, and lemon juice. Pour the creamy dressing over apple mixture and toss to coat evenly. Cover salad and refrigerate for at least 1 hour. Just before serving, stir in the remaining ½ cup of blue cheese and the toasted walnuts. Not a fan of blue cheese? Substitute 1/2 cup of grated Parmesan cheese in the dressing mixture, and then stir in 1/2 cup of cubed cheddar cheese before serving. To make it a dessert, use yogurt with a little bit of honey instead of the mayonnaise, buttermilk, and sour cream. It also tastes great with chicken or turkey.